Denis Alibegovic knew from the Golden State Warriors’ ascension to greatness that Stephen Curry would become his favorite player. The Downers Grove South guard was simply in awe of Curry’s ability. “His shot is very quick. Every move he does is fast,” Alibegovic said. “That’s how I try to resemble my game sometimes.” Alibegovic is 17 years old. 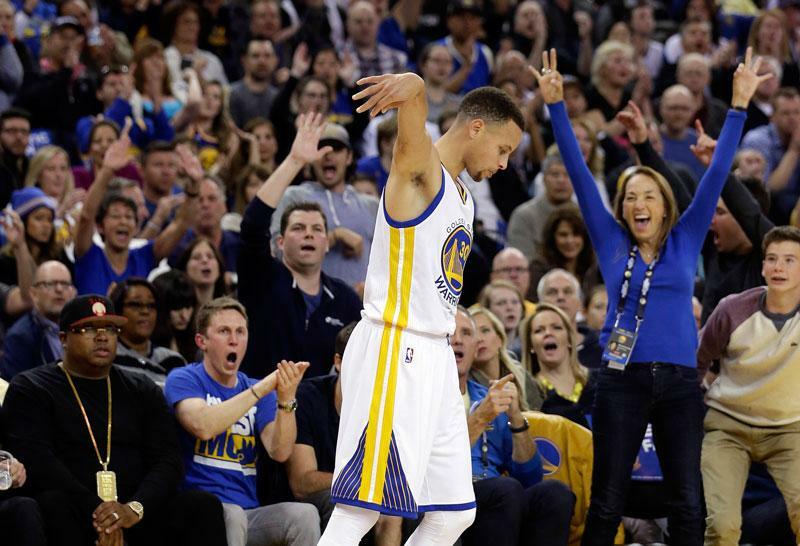 He’s one of the many enamored with Curry and the 3-point shot. But it’s that craze that might change the way basketball is played. It’s no secret that the NBA has evolved due to the 3-pointer, and even college basketball has embraced the shot. Yet when high school athletes are still so impressionable, it’s hard not to wonder if there’s a Curry-inspired era coming. For someone like Alibegovic, it’s “Be Like Steph,” not “Be like Mike.” And that starts with the way Alibegovic studies the game. “He shoots on the way up,” Alibegovic said. “That’s one thing I’ve noticed, and that’s why he can shoot so far from distance. He shoots while he’s basically jumping in the air. He doesn’t release it as his highest point. That makes him way more dangerous. Alibegovic himself has a reputation as one of the best shooters in Illinois. While he hasn’t secured a Division I scholarship, the 17-year-old said he shot 52 percent from 3-point range this past season and often works on his form in shooting. He said he can even shoot “two steps from half-court,” which is about 38 feet out. Alibegovic, however, might be in the minority for high school students. The NBA three-point line is from 23 feet out, where as the line for high school games is just 19 feet. Even then, the 19-foot mark can prove to be a difficult mark. Neuqua Valley head coach Todd Sutton is a firm believer that there hasn’t been a residual change in the way high school teams are handling 3-pointers. Furthermore, he added that by the time kids reach the high school level, they “definitely” know the difference between a bad shot and a good shot. Part of the appeal of Curry and the modern NBA three is the fact they are launching more 3-pointers. The 3-point line was implemented in the NBA for the 1979-80 season after the ABA introduced it in 1967. In the first season it was introduced, NBA teams took an average of just 2.8 attempts per season, making less than one per game. The usage of the 3-pointer gradually increased each year with teams now taking nearly 24 3’s per game, the most in league history. They also convert a league-high 8.4 times per game. It comes down to simple math — three is worth more than two. And teams have figured it out, as long as the looks are there. The impact, critics wonder, is that it could harm the younger generation of players by causing them to hoist 3-pointers instead of learning the fundamentals. But in watching the Warriors, Alibegovic said there are plenty of valuable things for high school athletes to learn. Alibegovic’s coach and Downers Grove South head coach Kyle Olson, though, said he has noticed an effect on the high school level from the emphasis on the 3-pointer in the NBA. He said the 3-point shot has eliminated the mid-range jumper. Effectively, spacing has become much more valued. With shooters spread out on the floor, it opens up the defense, allowing there to be more room to attack the paint. Olson also said that high school teams rarely put an emphasis on a pull-up jumper, part of the teams’ success on the next level. Olson said that the pull-up jumper is one aspect he’s trying to incorporate. An underrated aspect of the Warriors, Curry in particular, is the way they dribble and pass the ball. Olson admitted that some of his players lose track in this, and that they’ll re-emphasize drills to work on dribbling techniques. Alibegovic has picked up on it too — noticing the explosiveness of Curry’s dribbling. While the game might be changing, Alibegovic’s appreciation of his craft starts with Curry.